Cresting the Balcony on Everest, Taniguchi sees it: “a foot sticking out of the snow.” Gear still on. Four years earlier, his friend and fellow Denali guide Scott Fischer died right here, on this section. Is the foot Fischer’s? The departed, too difficult to remove, are left behind on Everest, entombed in snow. At the sight, the tears stream, freezing to Taniguchi’s face. Visibility through his goggles shot, he pushes on. Ostensibly, he is here to help Al Hanna, 69, make history by becoming the oldest Everest summiteer at the time. To improve their chances, they have doubled up on Sherpas—the usual ratio is one to one. They had extra oxygen bottles in place. They left high camp at 10 p.m., four hours earlier than most start. By noon, they finally reach the South Summit. Only one real challenge remains: the Hillary Step. And the Sherpas have already fixed the line. “It’s right in front of us,” says Taniguchi. But the image of the foot is nagging at him. “There’s a rule on Everest,” says Taniguchi. “At 2 p.m., no matter where you are, you turn around.” It may be only noon, but it has taken them 14 hours to get here—what typically takes climbers 6 to 8. Yet standing on this mountain, a mountain he’s now been on for more than two months, Taniguchi’s thoughts turn to home—to his wife, his kids—and to his allegiance to Hanna, who brought him here. A mere 320 feet away from the top, he calls it. The decision bought time that saved his life. About halfway down the mountain, they reach the Khumbu Glacier, which spills over a cliff and splits into miles of icy shards known as the Khumbu Icefall. “There are ice blocks as big as the Tanner Building just precariously hanging,” says Taniguchi. And the icefall moves. Skidding down-mountain at a rate of 3 feet a day, it has claimed more lives than any other stretch on Everest. Ladders must be tied together to cross crevasses, some hundreds of feet deep. In one section, where his team members turn inward to down climb, Taniguchi begins descending the slope like stairs. Wearing crampons, he lodges his left foot. His next step skids—and his left foot sticks. His left knee dislocates, every ligament blown. “They’re trying to tell me, ‘Don’t scream! Don’t scream!’” says Taniguchi. The vibrations could topple looming ice towers. Taniguchi tries to stand. They try bracing his knee with ski poles. But it just buckles. And the team can’t wait any longer. Another guide in the group insists the others carry on. So Taniguchi begins crawling. 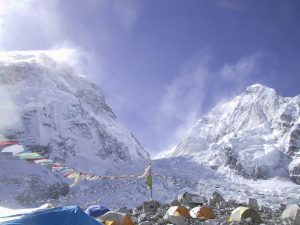 Taniguchi says the most incredible thing then happened: the Sherpas, after unloading their gear at base camp, came back. “It would be like, for us, going back into a burning building for a stranger,” says Taniguchi. 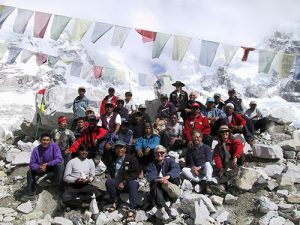 The Sherpas took turns piggybacking him out; in gratitude, Taniguchi later sponsored the head Sherpa’s daughter, Dawa Sherpa, to live in his home and study in America, undeniably changing her life.